Riders assemble at Presidio Park for a send-off picnic with members of local theatre groups. After lunch it's across the Golden Gate Bridge, along the northern shore of the bay and though the Napa Valley to overnight at Lakeport. 136 miles. Lakeport to Eureka via Fort Bragg and along The Avenue of the Giants in Humboldt Redwoods State Park. Along the way, riders will get to drive through a giant redwood. 212 miles. Eureka to Susanville through the Trinity National Forest, the Whiskey Town National Recreation Area and Lassen Volcanic National Park where, according to their web site, you can "witness a brief moment in the ancient battle between the earth shaping forces of creation and destruction. Nestled within Lassen's peaceful mountain forests you will find that hissing fumaroles and boiling mud pots still shape and change the land." 289 miles of unadulterated natural pulchritude. 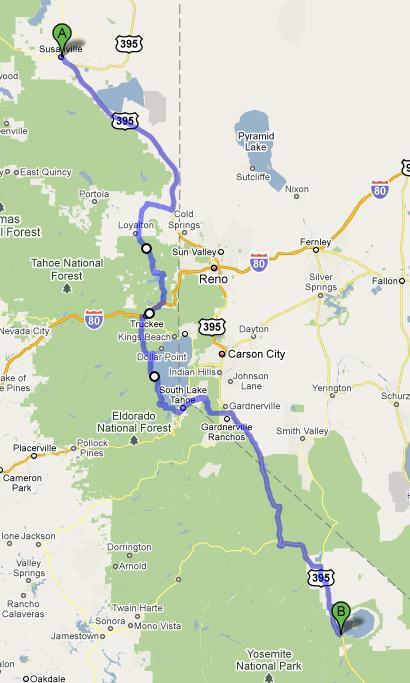 Susanville to Lee Vining via Truckee and west Lake Tahoe: 280 miles—the longest leg of the ride, but it's on a great road along the eastern slopes of the Sierra Nevada. We detour off Hwy. 395 long enough to slip along the western shore of Lake Tahoe, before reconnecting just south of Topaz Lake. Then it's sweeping turns and beautiful vistas all the way to Lee Vining, the gateway to Yosemite National Park. 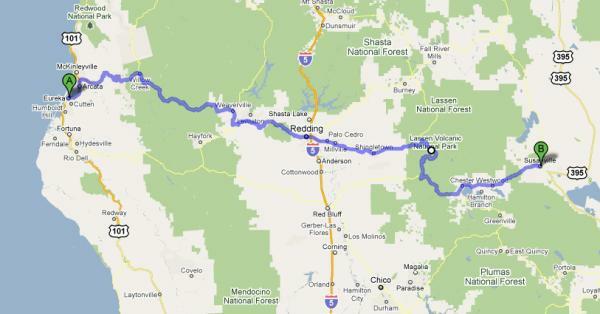 Lee Vining to Hollister via Yosemite National Park. Most of the day will be spent in the park. Hopefully its beauty will balance the featureless monotony of the San Joaquin Valley until we hit the Pacheco Pass going into Hollister. Hollister is considered the birthplace of the American biker. It was the site of the 1947 motorcycle rally/riot made famous by Marlon Brando in "The Wild Ones." Dinner at Johnny's Bar and Grill—where it all began. 221 miles. 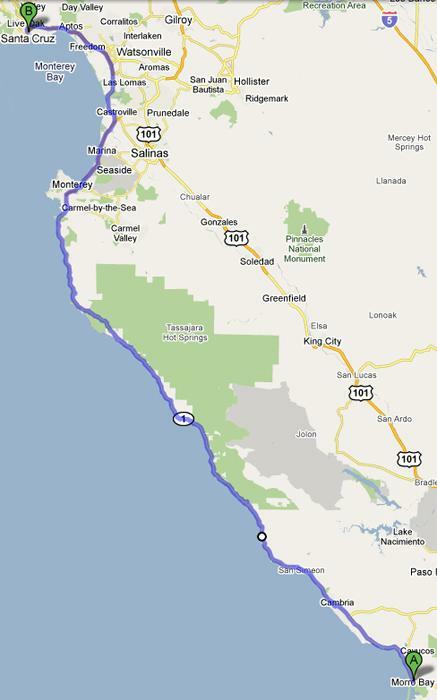 Hollister to Morro Bay via Hwy. 25 and 198. Along the inland edge of the Pacific coastal mountains. 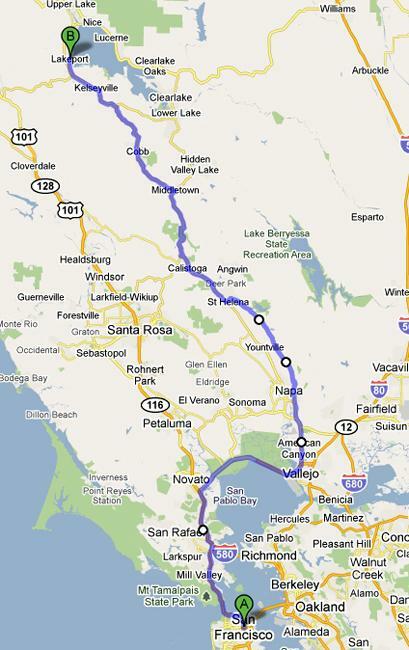 Rolling hills, nice roads and a laconic pace for 148 miles. Morro Bay to Santa Cruz on the spectacular California Highway 1, which runs along the cliffs overlooking the Pacific Ocean. Lunch in Carmel-by-the-Sea. If we get lucky (punk), we might get Carmel local, Clint Eastwood to join us for a photo op or maybe part of the ride. Can't hurt to ask, right? Dinner with the Pleasure Point Night Fighters surf club in Santa Cruz. 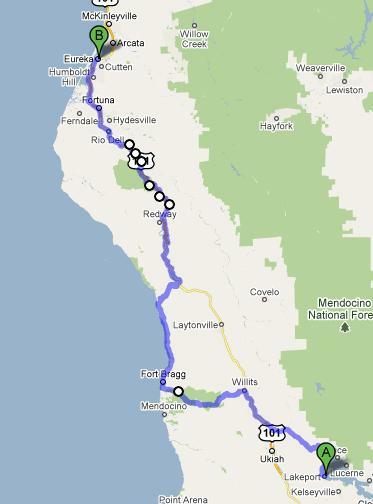 Santa Cruz to San Francisco via Hwy. 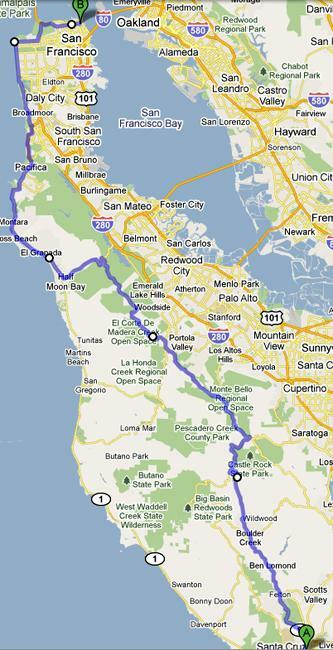 9 and Skyline Drive—with lunch at Alice's Restaurant—to Half Moon Bay and then back to the City. Hopefully the day will include a run down Lombard Street, "the crookedest street in San Francisco" and up to Coit Tower in Pioneer Park for a final photo op and goodbyes. 88 miles.